Had Vasif Adigozal only written "Carnation" (1960) which dozens of Azerbaijani singers have performed in various arrangements, it would have been sufficient enough for him to assume an honorable place in the history of Azerbaijani music and culture. Adigozal [alternative spellings: Adigezalov, Adygazal], one of Azerbaijan's most distinguished composers who passed away on September 15, wrote "Carnation" at the age of 25, as a tribute to Natavan (1832-1897), a famous 19th century poetess and ruler of Karabakh - a mountainous region known for being a cultural center in western Azerbaijan. Left: Composer Vasif Adigozal is best known for incorporating traditionial modal mugham music into his works - both orchestral and solo pieces. Quite amazingly, this small piece embodies many characteristic features of Adigozal - both as a composer and personality. What immediately impresses one about Adigozal's music is his innate and comprehensive knowledge of mugham - the richest genre of traditional modal music of Azerbaijan. 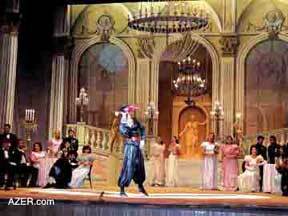 Above: Scenes from Vasif Adigozal's opera, Natavan, which opened on December 7, 2003. This could be expected since Vasif was the son of Zulfugar Adigozal (1898-1963), a prominent "khananda" singer of Azerbaijani mugham. Simply put, Vasif grew up in an atmosphere, which was saturated with mugham music, as many famous musicians often visited their home and performed their traditional works. These unique experiences and memories manifested themselves in Vasif Adigozal's music through various genres, including large symphonic works, small instrumental pieces, operas and operettas, as well as soundtracks for plays and movies. For example, his Fourth Symphony "Segah" (1998) and his oratorio "Garabagh Shikastasi" (1989) took their names from Azerbaijani mughams. Another example of the influence of mugham on his work is the piece called "Mugham Sonata" for organ. Vasif Adigozal followed what might be called the romantic stream of Azerbaijani music to become a great lyrical composer. 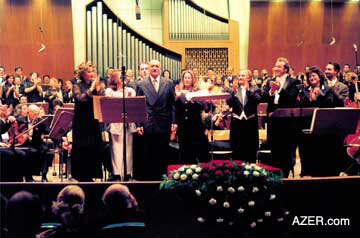 Left: Grand Finale of "Chanakkale", an Oratorio composed by Vasif Adigozal performed here by the Symphonic Orchestra of the Turkish President, Ankara, Turkey, 1998. Vasif's son Yalchin conducted. He was like him to bare his thoughts and feelings directly, through beautiful melodies and colorful harmonies. This meant that, in general, he distanced himself from 20th century experimental music. The one exception was his Second Symphony (1970), which was based upon the 12-tone technique, an avant-garde expression of contemporary music. Though this work was sufficiently successful, the composer returned to pursue a more conservative style. Vasif Adigozal was a genuine professional, and greatly influenced by Gara Garayev (1918-1982), the distinguished Azerbaijani composer and teacher with whom Vasif had studied at the Azerbaijan Conservatory (now Music Academy) in 1953-1959. Adigozal excelled both as composer and performer-a rare combination these days. He majored in Piano as well as Composition at the Azerbaijani Conservatory. His piano professor was Simuzar Guliyeva and throughout his career, he gave numerous concerts on stage as a pianist and accompanist. In the early 1960s, he accompanied legendary Azerbaijani singer Rashid Behbudov (1915-1989). Later on, he pursued a solo career and performed his own pieces. This explains Adigozal's interest in piano music and the distinctive contributions he made to the genres of piano music in Azerbaijan. Vasif Adigozal's piano concertos and preludes continue to be appreciated and performed by Azerbaijani pianists of all generations. As an outstanding public figure, his opinions always carried a particular weight in the world of Azerbaijani music as he was greatly respected by colleagues and friends. Adigozal also was actively involved with the administration of music. 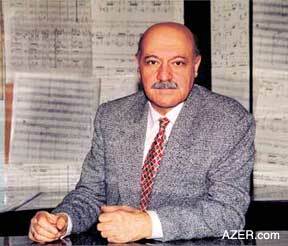 For example, in 1973-1983, he was the director of the Baku Music College. He showed extreme courage and determination up to the very last days of his life. Although he had become seriously ill, he continued to carry out his responsibilities both at the Composers' Union where he was Chairman (1990-2006), as well as the Music Academy where he had taught since 1961, and where he had chaired the Department of Choral Conducting (1992-2006). Vasif Adigozal enjoyed official recognition as the recipient of Azerbaijan's highest national awards - People's Artist of Azerbaijan (Khalg Artisti, 1989), State Prize (Dovlat Mukafati, 1990), Glory (Shohrat Ordeni, 1995), and Independence (Istiglal Ordeni, 2005). Known for his charisma and innate ability to value people and situations fairly, he was known for his directness laced with diplomacy at the same time - that, along with his amazing sense of humor. He was always proud of his family - his wife Khalida and two sons Yalchin and Toghrul, his daughter-in-laws Farah and Sabina, and grandchildren - Zulfugar, Khalida and Tamerlan. Unlike Toghrul who made a career in medicine, Vasif's other son Yalchin (born 1959) continued the Adigozal music dynasty. A graduate of the St. Petersburg Conservatory and Vienna Music Academy, Yalchin has served as the Chief Conductor at the State Symphonic Orchestra in Azerbaijan during the 1990s. 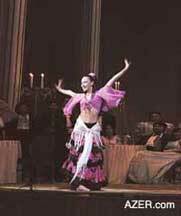 He now works with the Azerbaijan State Opera and Ballet Theater. In Azerbaijan, we have a tradition of placing carnations on the graves of our dear ones - two blossoms - to indicate that our spirit is united with the one who is deceased. These days Vasif Adigozal's "Carnation", along with many of his other works can be heard on TV and radio - clearly a sign of sympathy and gratitude to an outstanding musician and great individual who has just left us. Azerbaijan commemorates its son whose legacy has already become an indispensable part of the national music and culture.